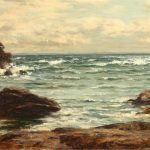 Joseph Henderson RSW (1832–1908) was a Scottish Landscape painter, genre painter, Portrait painter and marine painter. He exhibited his work at the Royal Scottish Academy and at the Royal Glasgow Institute of the Fine Arts. He also exhibited at the Royal Academy in London from 1871 to 1886 and in Suffolk Street Galleries from 1882 to 1884. He was the President of the Glasgow Art Club, in which city he settled in 1852.